CAIRO - Riot police clashed with supporters of Egypt's ousted Islamist president on Friday, leaving 11 dead in ongoing street battles where an increasing number of protesters are carrying firearms ahead of a key referendum they urge to boycott later this month. Fighting spread through heavily populated residential areas in several cities and provinces including Cairo, Giza, Ismailia, Fayoum, as hundreds of Muslim Brotherhood members and their supporters threw rocks at security forces who responded with water cannons and tear gas. Black smoke hung in the air as protesters burnt tires and hurled Molotov cocktails and fireworks at black-clad security forces. A number of police vehicles were set on fire, public buses were damaged and main roads blocked by protesters. 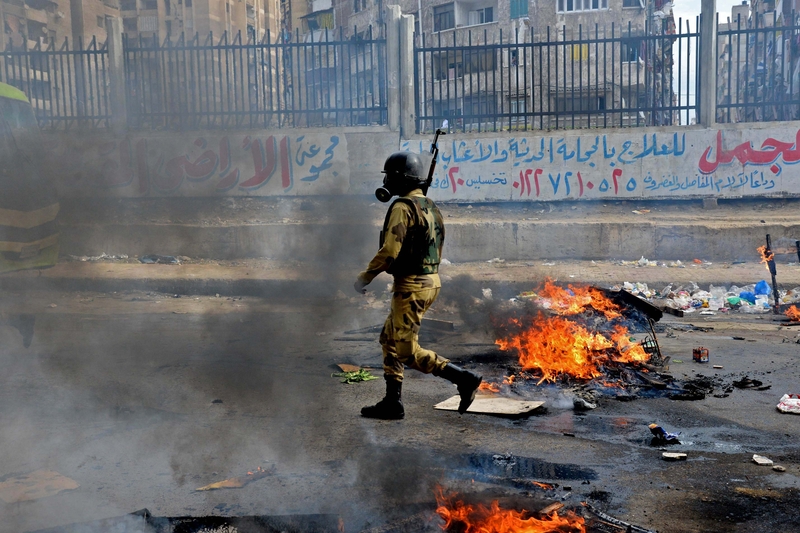 The Health Ministry said that 11 people, including three in Cairo, were killed and more than 52 injured in the protests. A Brotherhood-led alliance said on its Facebook page that the death toll had reached 19. In the Mediterranean city of Alexandria, an Associated Press cameraman saw dozens of armed protesters carrying homemade pistols and engaging in violent clashes with security forces, despite Brotherhood claims that protests are peaceful. In the eastern district of Sidi Bishr, 50-year-old Zeinab Abdel-Hamid was killed by a gunshot. The Interior Ministry said in a statement that 122 Brotherhood protesters were arrested carrying homemade grenades and Molotov cocktails. Violent protests have been recurrent since the military ousted Mohammed Morsi in a July 3 coup after millions of anti-Islamist protesters demonstrated to demand his resignation. The numbers of those hitting the street in support of the Brotherhood - Egypt's most organized political group - have dwindled dramatically over the past months after the military-backed interim government launched a crackdown. Hundreds were killed when authorities broke up protest camps, thousands of Brotherhood members have been arrested and scores were sent to trial. Friday's protests however appeared to be the largest and most violent since a three-month state of emergency and nighttime curfew expired in November. The government has sought to drain the group's resources, ordering last week the seizure of assets of hundreds of non-governmental groups on suspicions of links to the Brotherhood. Hundreds of the group's leaders and businessmen have also had assets seized.
} Over the past months the group changed tactics, relying more on women and student supporters to lead protests ahead of two main events: the second session of Morsi's trial on Jan. 8 on charges killing of protesters, and the upcoming referendum on a new constitution drafted by a secular-leaning assembly on Jan. 14 and Jan. 15. In latest blow to the Brotherhood, the government designated it a terrorist organization and accused it of having ties to a known al-Qaida-inspired group called the Champions of Jerusalem. It has claimed responsibility for many attacks including a deadly Dec. 24 bombing of a security headquarters in a Nile Delta city. The interim government considers the referendum a milestone in a transition plan it laid out ahead of Morsi's ouster, which envisions presidential and parliamentarian elections in the coming months. The draft charter is an amended version of the 2012 constitution drawn up by an Islamist-dominated panel under Morsi, which was suspended during the coup. In a strongly worded Friday sermon, Minister for Religious Endowments Mohammed Mokhtar Gomaa warned against supporting calls by protesters to stop paying utility bills to oppose the government, in reference to a Brotherhood-led campaign. "Those aiming to topple the state are enemies to God and the Prophet" he said at the Al-Hussein mosque in downtown Cairo. Also on Friday, three explosions targeted a military and police convoy in the volatile northern Sinai Peninsula, wounding four soldiers, a security official said. The explosions, one of which was from a roadside bomb, hit near the town of Sheikh Zuweid, close to the border with the Gaza Strip, he added, speaking on condition of anonymity in line with regulations. Despite the clashes, Fitch Ratings raised Egypt's economic outlook from negative to stable, although its issuer default ratings and country ceiling remained at B-. The international agency attributed the improvement to major aid from countries in the Persian Gulf after Morsi's ouster that amounted to billions of dollars in grants and deposits that had "eased pressure on reserves." The oil-rich countries had been at odds with Morsi's Brotherhood group and feared that its offshoots in their countries would challenge ruling royal families.